69 Scottish tunes for solo cello, including slow airs & laments, marches, strathspeys, reels, jigs, polkas, hornpipes and a quickstep. Intermdiate to advanced standard (grades 4 to 8). Includes CD featuring Kevin McCrae's "Bonnie" recorded by the composer and all other tunes performed by Neil Johnstone. Ideal for concert performances and informal sessions. 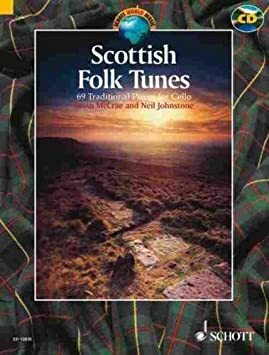 CONTENTS: Ae Fond Kiss, Amazing Grace, Bonnie, Braigh Loch Ioll, Caol Muile, Chi Mi na Mor-Bheanna, Coilsfield House, Culloden Day, Cumha Mhic Shimidh, Dr Morrison's Seven Thistles, Easy Club Reel, Farewell to Nigg, Fear a' Bhata, Hamilton House, Hector, Highland Cradle Song, History of the Cello in Scotland, Hornpipes: The Mathematician, I Bhi Ada, I Have a Bonnet Trimmed with Blue, Janine' s Reel, Jigs: Cork Hill, Lady Ann Hope's Favourite, Lament for Flora MacDonald, Leaving Stornoway, Louden's Bonnie Woods and Braes, Lovely Stornoway, Marches: Fr John MacMillan of Barra, Miss Sally Hunter of Thurston, Miss Shepherd, Mo Dhachaidh, Mrs Hamilton of Pencaitland, Nathanial Gow's Lament for the Death of his Brother, Niel Gow's Garewell to Whisky, Niel Gow's Lament for James Moray of Abercairney, Niel Gow's Lament for the Death of his Second Wife, Notes on the Tunes, oran a' Chaiora, Perthshire Volunteers, Polkas: Queen Victoriy's Diamond Jubilee, Pretty Peggy, Prince Charlie's Last View of Scotland, Quickstep: The Lovat Scouts, Reels: The De' il Among the Tailors, Roslin Castle, Sir Reginald MacDonald, Slow Airs and Laments: Sins Bhan, Strathspeys: Iomadh Rud Tha Dhith Orm, Terribus, The 6th Suite Jig, The Athole Highlanders, The Barron Rocks of Aden, The Bass and Tenor Clefs, The Battle of the Somme, The Battle of Waterloo, The Cradle Song, The Drunken Piper, The Flower of the Quern, The Glasgow Gaelic Club, The Iron Man, The Kilt is My Delight, The Laird of Drumblair, The Left Handed Fiddler, The Meeting of the ... CD included. CELLO SOLO Grade level: 4,5,6,7,8 Includes CD.